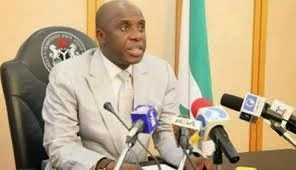 The Rivers state Governor, Rotimi Amaechi has said no court can dissolve the newly elected Local Government Chairmen in Rivers state. Amaechi gave the assurance while swearing-in the Chairmen at Government House, Port Harcourt. The Governor who charged the 22 newly elected Local Government Chairmen to deliver dividends of democracy to the people at the grassroot, urged the them to remain committed to tenets of democracy. He maintained that the election was a true reflection of the wishes of the people, adding that the Rivers state Independent Electoral Commission, RSIEC complied with relevant sections of the Law establishing it. “RSIEC as a commission has complied with the Law. Those who did not participate in the election, its their business. We wanted to prove to the country that the election of March 28 and Aprill 11 were rigged. We wanted everybody to come out and vote and see the true reflection of the people. “You can see a Local Government like Port Harcourt there were 26,000 accredited voters and 23,000 voted for APC. That shows you that it is a true reflection of an election. “Where those people got 1million votes. That is why they were afraid to come out. “All we have done is to comply with the Law. I hear they are threatening to dissolve. The courts will determine that. We will be prepared as a party to meet them. “So I want to urge you to work hard and to pray hard,” Amaechi said.